GRO sessions come back to where it all began with the development of the first Bloomington, Indiana GRO Crew with the support of GRO’s founder, Courtney Payne – Taylor. GRO Crews are a group effort in each community, but it begins with a gathering to meet, connect and discuss goals and ideas for building the GRO mission in our town. 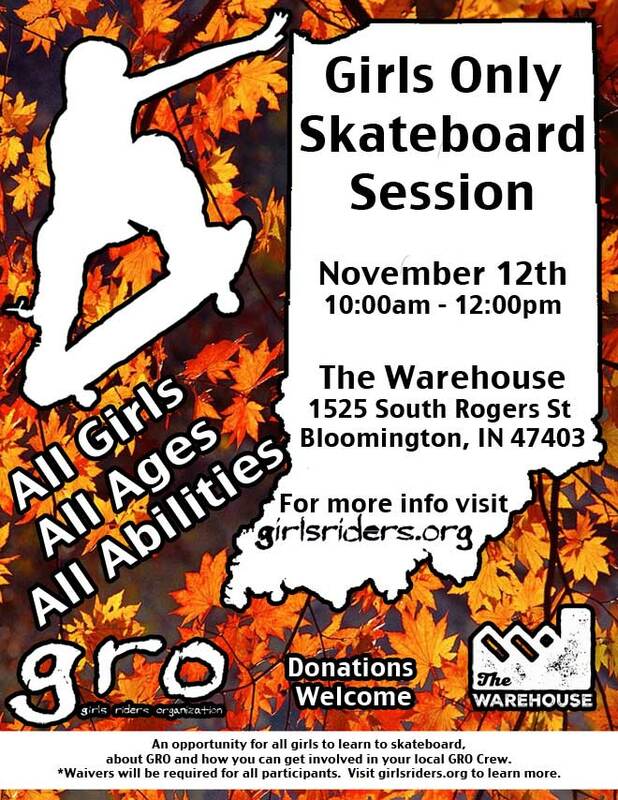 This first gathering includes a GRO Crew Meeting and Girls Only Skateboard Session on November 12th at the Warehouse from 10:00am – 12:00pm. All girls, all ages and abilities are invited to take part in this event. Families too! Learn about GRO and skateboarding in this positive environment all centered around supporting the amazingness of girls! Waivers required for all participants. Waivers can be completed at the event. If you are under 18 years old you will need a parent or legal guardian present to sign. If needed you can complete the waiver online in advance for the warehouse by clicking here.